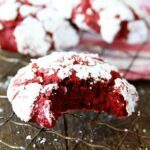 Homemade desserts have always been a part of our Valentine’s celebrations. One of the very first things Heather ever made for me was dinner on Valentine’s Day followed by these homemade chocolate brownies in the shape of hearts. They were amazing and it’s always been a fun memory for us. Ever since then, we always do some type of homemade dessert on Valentine’s Day. It’s just become tradition. But making something homemade doesn’t necessarily have to mean making something from scratch. 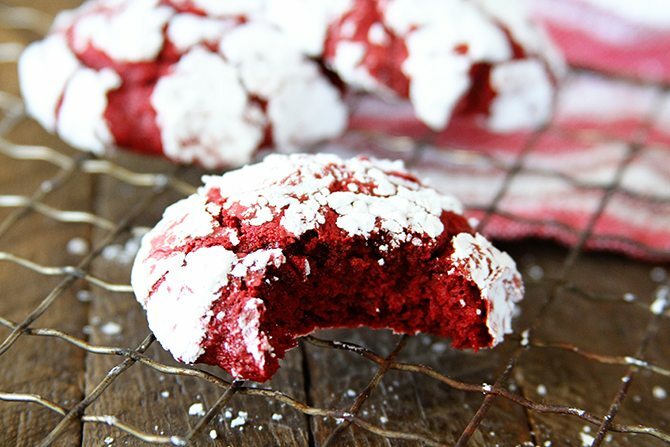 These Red Velvet Cake Mix Cookies are the perfect example. They’re soft and pillowy, super delicious, and ridiculously easy! Next scoop a heaping tablespoon of the batter into a bowl with about 1 cup of powdered sugar. Again, sticky batter. Using a cookie scoop really helps make this easier. Otherwise two spoons will work. Now, roll the batter around to coat it with the powdered sugar. Place the batter on the prepped cookie sheet. You can do this with your fingers now as the powdered sugar coats the batter and makes it so much easier to handle. Place them about 3 inches apart. Bake for 12 to 14 minutes until just set. Remove them from the oven and allow them to cool on the pan for about 5 minutes. Now, if you’d like, you can add a chocolate heart to the center of each cookie by pressing it lightly down into the cookie. Again, totally optional, but sure pretty. 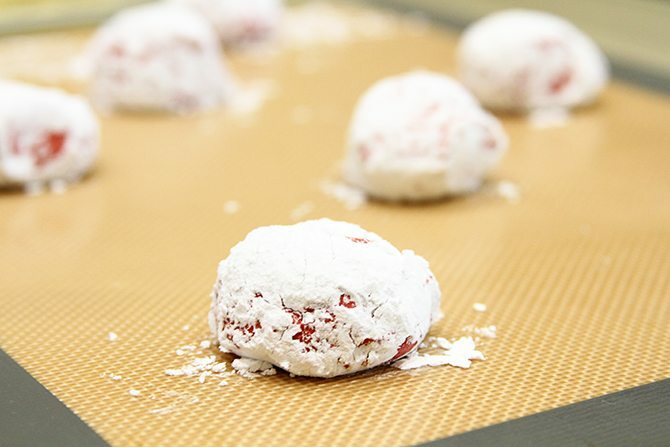 Allow the cookies to cool on the baking mat or parchment until completely cool. These cookies are super soft and pillowy and trying to move them too early will result in disaster. I often just slide the mat or parchment off the pan onto the counter and allow them to cool there while I use the pan to bake more. Preheat the oven to 325° F and line a cookie sheet with a silicone baking mat or parchment paper. In a large bowl, combine the cake mix, whipped topping, and egg. Stir until combined. The batter/dough will be very sticky. Pour the powdered sugar into a small bowl. Scoop 1 heaping tablespoon of batter into the powdered sugar. A cookie scoop is very helpful with this. 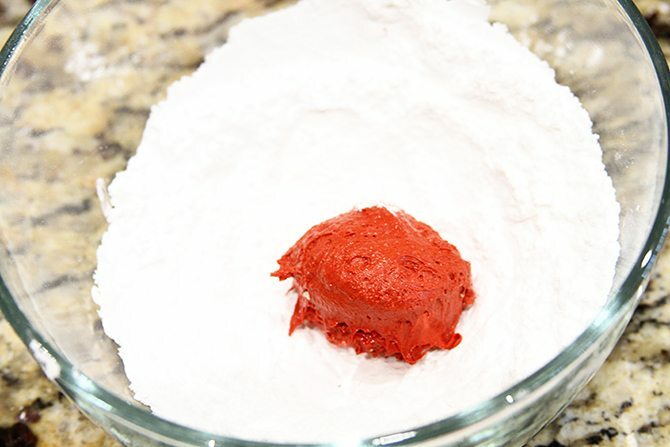 Roll the batter to coat with the powdered sugar. Place the sugar coated batter onto a cookie sheet about 2 to 3 inches part. Continue until the sheet is full. Bake for 12 to 14 minutes or until set. Remove from the oven and allow to cool for about 5 minutes on the pan. 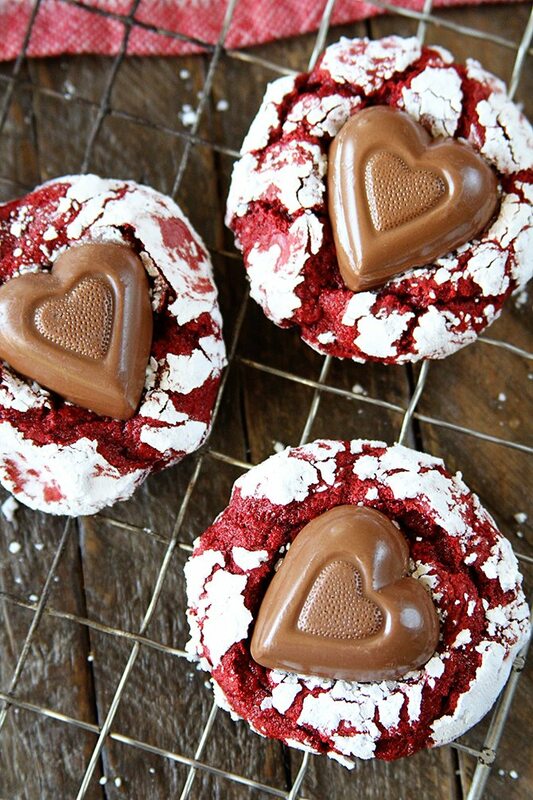 Place a chocolate heart in the center of each cookie, if desired. 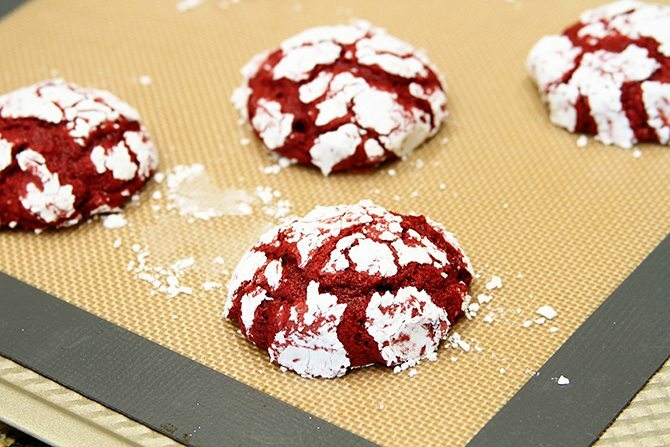 Cool completely on the baking mat or parchment, then use a spatula to remove the cookies. Repeat until all the batter has been used. Store in an airtight container. These look AMAZING!!! Definitely gonna have to try them! Thanks! Hope you love ’em! I made these today. The red velvet cake box was 15.25 oz. I had to bake at 350 in my gas oven for about 20 mins. The first ones were much too sticky after baking following the original recipe. Otherwise the recipe seems to work well. Have to make 6 dozen of these for a party tonight. 1st batch turned out really flat and a little doughy in the middle… any suggestions? Try chilling the dough for about 30 minutes, then scooping and baking. This recipe has been around forever! I can remember it from the 1970’s but had not used it due to years of scratch cookie baking. 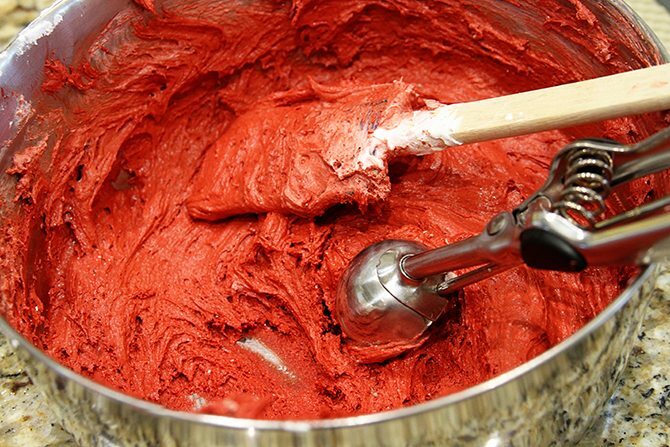 Now I use cake mixes more often–takes less time and effort. By the way, the box cake mixes used to be 18 oz, and then some manufacturer decided to use 3 eggs for more body or whatever and took out some mix, which made the box mixes the current 15 1/2 oz, so you might need to adjust the recipe a bit. Great cookies, though! The best one’s always are, right!?!? Different brands weigh different amounts. I find them anywhere from 15.25-oz to close to 18-oz. 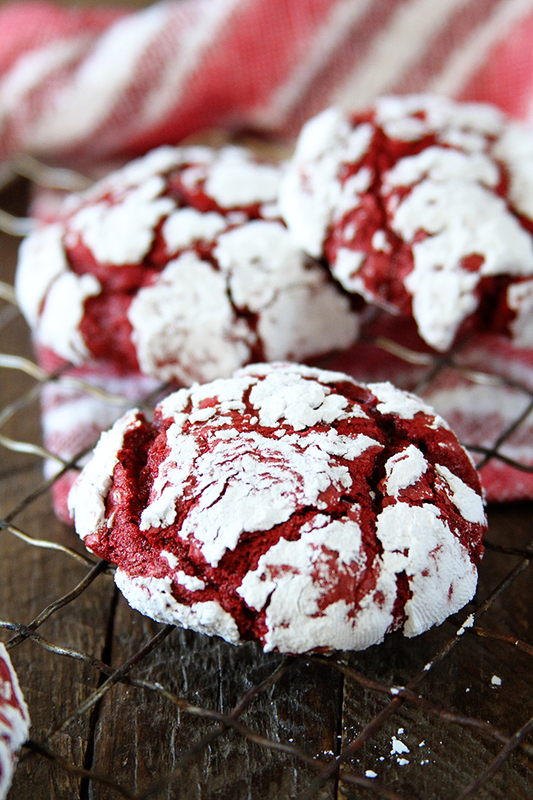 That said, and for whatever reason, red velvet almost always weighs more.